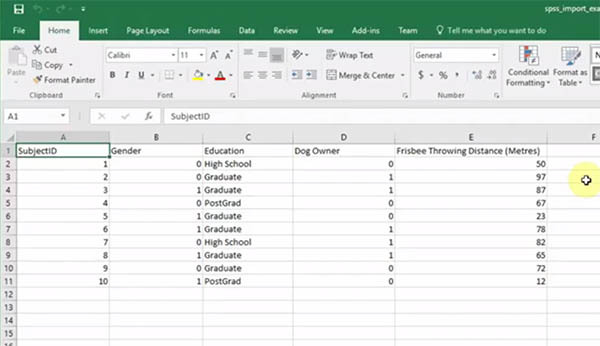 This tutorial will show you how to import data from an Excel spreadsheet into SPSS. It will also show you how to transform a variable that has been coded as text into a numeric type. Open up the Excel spreadsheet from which you wish to import your data. In our example we have 5 columns of data, as below. There are a few things you need to look out for before starting the process of importing your data into SPSS. First off, you need to ensure that variable names are in the first row; and also that there is no gap between the first and second row of the spreadsheet. It is also best practice for your data to be numerical. In our example, the Education variable is coded as text - that is, Education is either "High School", "Graduate" or "PostGrad". Later in the tutorial, we'll show you how to change this to a numeric type within SPSS. One final thing is to clean up any data that requires it. For example, if you had coded one of the Frisbee Throwing Distance data items as "50m" rather than "50", this would be the right time to correct it. This is particularly important if you are using an early version of SPSS. Once you have cleaned up your data, you can open up SPSS.